From opening bars of the overture to Idomeneo, widely considered Mozart’s first major opera, one hears the boundless inventiveness and vitality of the composer we associate with Don Giovanni, Le Nozze di Figaro, and Così Fan Tutte—some of the most enduring works ever written for the musical stage. We hear a young man bursting to break free from the restraints of tired theatrical customs, who had yet to begin his collaboration with the equally ingenious librettist Lorenzo DaPonte. 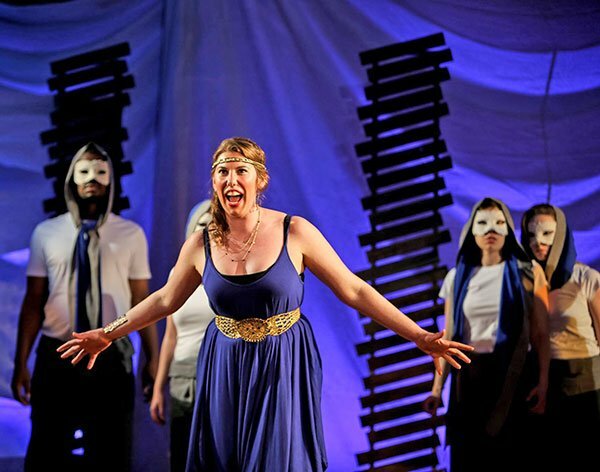 The metaphor of talented youth hampered by tired convention might well apply to the Boston Opera Collaborative’s production of the opera, seen on Saturday at Longy’s Edward M. Pickman Hall. The evening showcased the vocal prowess of BOC’s gifted young artists while ultimately failing to satisfy dramatically. In a judiciously abbreviated two-hours, the cast and crew did justice to the score without winning the case for Idomeneo’s inclusion in the ranks of Mozart’s greats. For the property itself, suffice it to say the spirit of the music is willing but the flesh of the book is weak. Librettist Giambattista Varesco takes his scenario from figures in Greek mythology, though the plot is most reminiscent of the Biblical story of the sacrifice of Isaac (indeed, the surtitles paraphrased another Biblical utterance, reminding the king that he must “render unto Neptune that which is his.”) In brief: Idomeneo, king of Crete, is returning home after the Trojan War when his ship is caught in a storm. Desperate to be saved, he makes a promise to the god of the ocean to sacrifice the first person he comes across in exchange for survival. The king makes it onto terra firma and as bad luck would have it, the first person he sees is his own son, Idamante. Conflict ensues. Soprano Jessica Jacobs boasts a sizeable instrument with a nightingale’s vibrato (which she is capable of employing to thrilling effect in the verismo repertoire, as I learned when I reviewed her Mimì in NEMPAC’s La Bohème last summer.) However in the role of Ilia, the captured Trojan princess in love with her erstwhile enemy’s son, Jacobs’ sound seemed a little ungainly, her delivery lacking focus in the opening act. That said, she seemed to master the scale of her part over the course of the evening’s first half, and by the third act, was in fine form, giving a sensitive reading of “Zeffiretti lusinghieri”; her voice seemed to embody the very breezes described in the text. Mozart’s Elettra is a substantially different creature than both her mythological antecedent and her Straussian successor—here, Elettra serves more as the stock socially-advantaged-yet-undesired third in a love triangle than a crazed, vengeful princess. 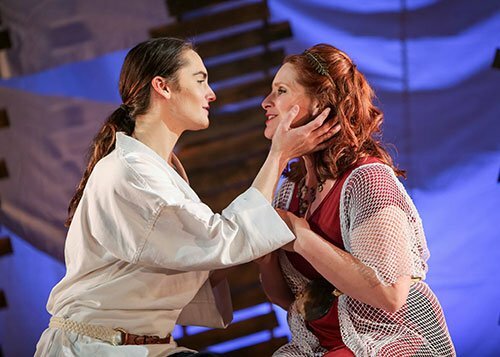 Until the final scene, Agamemnon’s daughter has little to do other than shoot jealous glances at her rival—the late British record producer Erik Smith once remarked “Unfortunately nobody takes the slightest notice of Elettra. Perhaps that is why she goes mad.” Lindsay Conrad brought her reliably secure technique and bright tone to the role. Michael Merullo lent his supple, strong-but-gentle tenor to the role of Arbace, the king’s counselor. A nod must also be given to the superlatively talented chorus, which sang with great precision and euphony, eliciting just as much aural delight as any one of the principals. As the Cretan monarch, tenor Stefan Barner proved the true king of this show, ruling over his costars with masterful command of both style and technique. His stage persona carried impressive gravitas, and of all the singing actors onstage, Barner seemed the most at home in his character and his vocal part. He managed the punishing second-act “Fuor del mar” aria with aplomb, imbuing the high notes with a heroic ring. He is a pleasure to listen to in this repertoire; I am eager to hear more from this rising Mozartian. Greg Smucker, who usually directs affecting stagings, seemed somewhat adrift in this one. Without exception, the principal actors seemed to have difficulty connecting with the deeper emotional truths of their roles; there is not much in the way of dramatic tension present in the characteristically static opera seria libretto, but one would have liked to have felt a greater connection between the singers’ vocal performances and their characters’ inner lives. The movements of the chorus were stylized and streamlined, recalling the Royal Shakespeare Company’s 1984 staging of Oedipus Rex, but seemed devoid of the epic feeling that gives Greek drama its power. The principals seemed caught between stylization and naturalism—there was a prodigious amount of aimless wandering about the stage, as characters appeared to enter and exit with little motivation. Kristen Conolly costumed to good effect at times. She dressed Brown in a white tunic and blue trousers with her dark hair pulled back; the slender, stone-faced presence resembled nothing so much as the hero of a film by Kurosawa, stoically accepting both his duty and his fate. This suited Idamante admirably, though other costume elements seemed to distract. Merullo’s robe, presumably meant to be the garment of a noble lord, looked more like a plush bathrobe. Andrea Nice’s minimalist set recalled Greek fishing villages with its panels of wooden slats connected by strips of white fabric. This served as mostly blank canvas for Tommy Neblett’s choreography, which included the representation of Idomeneo’s storm-tossed ship as chorus members pulling the rope-bound Barner back and forth in a rather sluggish tug-of-war. (It might have helped if this scene were performed by supernumeraries, who would not have had to concern themselves with vocal production while executing blocking.) Chris Bocchiaro’s lighting added some visual interest; his projections onto a slack scrim evoked sails on a billowing sea. Harpsichordist Vivian Montgomery assured as continuo artist, lending stability to her colleagues. The ten-piece instrumental ensemble (including synthesizer) needed about an act and a half to fully come together, but were capable of warm and effective utterances. Daniel Stackhouse’s oboe particularly relished Mozart’s inclusion of virtuoso passages written for a gifted contemporary. Though Idomeneo does not constitute Boston Opera Collaborative’s strongest offering to date, it is still indicative of the talent and drive present in this energetic young company. As a whole, BOC has given us an invigorating tenth anniversary season, and I look forward to their future work. 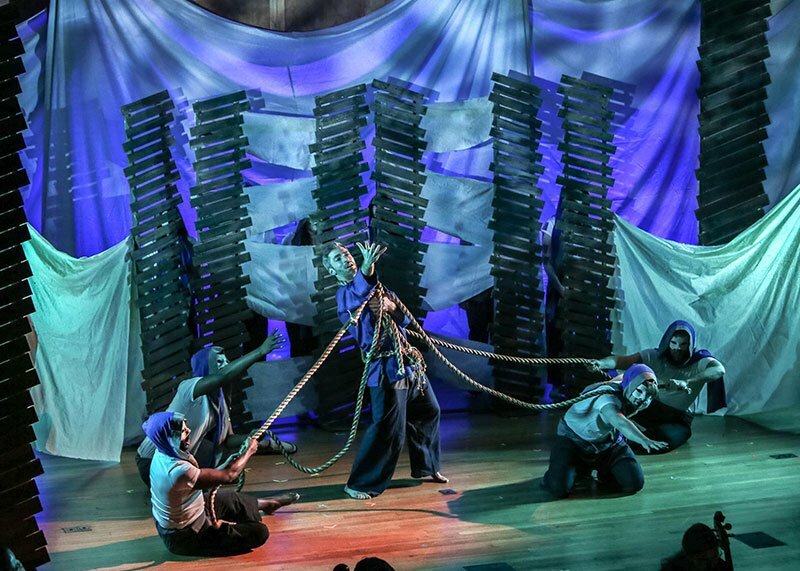 Idomeneo repeats on June 16th, 17th, 18th and 19th in the Edward M. Pickman Hall at Longy School of Music of Bard College in Cambridge. is the close Biblical parallel, rather than the binding of Isaac. Thank you, Lois, and point taken. I drew the parallel to the binding of Isaac owing to Neptune’s eleventh-hour intervention and his decree that Idamante should be spared. But you are of course correct in that Idomeneo’s circumstances more closely resemble those of Jephtha rather than Abraham. I heard the alternate cast in a recent performance. I must say I’m impressed with the singing ability of the whole cast although perhaps without the articulation and spot on intonation in melismas which admittedly is rare even with seasoned pros. Nonetheless, excellent harpsichord playing by Ms. Montgomery together with singing made the recits best part of the evening. Tuning (woodwinds for the first half of the program) and Intonation was an overall problem in the orchestra particularly noticeable because of its small size; one would expect better even considering their pre-professional status.